An allergy is the result of an over-active response by the body's immune system to harmless substances such as pollen, foods, and dust mites. Whilst in most people these substances, commonly known as allergens, pose no problem, in allergic individuals, their immune system identifies them as a threat and produces an inappropriate response. Any substance that triggers an allergic reaction is known as an allergen. Some of the most common allergens include: grass, tree pollen, dust mites, insect stings, animal dander, nuts and other foods. Moderate and severe allergic reactions eg. Anaphylactic shock, is a life threatening condition and as such,requires immediate emergency medical attention. 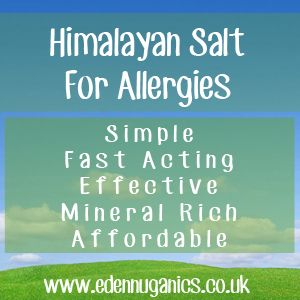 For that reason, this article refers only to the use of Himalayan salt for mild allergies. How can Himalayan Salt Help? This ancient mineral salt comes from mines deep within the Punjab regions of the Himalayan mountains, where the salt has laid untouched and away from toxins and pollutants for thousands of years. Unlike conventional table salts that are simply made of sodium and anti caking agents, Himalayan rock salt contains upwards of 60 minerals and trace minerals that can be used by our bodies. Minerals including magnesium, calcium and copper found in Himalayan salt are essential for a variety of bodily functions, including building strong bones, teeth, blood, skin and hair, for nerve function and even helping to turn food we eat into energy. It has been well known for hundreds of years that salt therapy or Halotherapy is very effective. Sitting in rooms covered in salt rocks or in salt caves is endorsed by conventional doctors to improve respiratory problems. Asthmatics have long-been sent to sit in salt rooms or salt caves for a couple of hours per day if possible. Himalayan Salt Lamps are new to this part of the world but are said to have the same beneficial properties, are easily used in your own home and are relatively inexpensive. (Sadly, not everyone has access to a 'salt-room' on their doorstep!) Swimming in the Dead Sea or other very salty seas is also a well-known effective treatment for skin problems like eczema and psoriasis. Obviously not everyone has access to the Dead Sea on a regular basis so a bath full of Himalayan Salt is a good alternative! Salt inhalers which can be used during the day just like a regular inhaler are said to be most effective in reducing and even preventing asthma attacks. The good thing about these therapies is that they are relatively inexpensive and risk free with no known side-effects. So why not give Himalayan Salt a go. You have nothing to lose and only health-benefits to gain! The most popular method for including this salt into your diet is by dissolving crystals in distilled water which creates a mineral rich saline solution known as Sole (so-lay). Adding around 2 tablespoons of Sole to a glass of fresh water or green tea each morning is a perfect start to your day.